Camphor Laurel seeds were brought to Australia in 1822 and the plant was re-introduced in 1855 and widely distributed to horticulturalists and botanical garden etc. around that time. With the removal of the Big Scrub Rainforest and the establishment of farms it was recommended by botanists as a good replacement tree for a number of reasons. It was used for windbreaks, containment of soil erosion, and as an ornamental garden tree - hence many large specimens can be seen today in school yards and older established public places. Throughout the 20th century, as a result of the decline of the dairy industry, camphor laurels have been allowed to proliferate on disused pasture along the coastal hinterland of NSW and parts of Qld. Camphor laurels were still recommended for planting up until the 60's and 70's when it was realised that they were fast becoming a weed in the same category as other introduced plants such as lantana and groundsel bush. As a result, landholders now find themselves with a problem on their hands with the necessary removal of these trees, in particular where birds spread them into remnant bushland and along fence lines. The prevailing attitude of people on the land is to remove them by localised poisoning and/or felling and burning. The trees are also considered an obstruction to rainforest regeneration due to the fact that they inhibit expansion of native plant growth. Camphor Laurel leaves are bright green in colour, and have wavy edges. Camphor Laurel will flower prolifically early in Summer. The flowers are tiny, and white-cream in colour. The fruit/seed is black, shiny and prolific and can be present from Winter through to Spring. The root structure contains massive lateral and tap roots. One of the Camphor Laurel's most noticeable characteristics is the strong camphor smell which the leaves emit when they are crushed. Camphor Laurel will germinate readily from seed, suckers and will also coppice from damaged roots. An adult tree will produce over 100,000 seeds per year, which are then spread by fruit-eating birds. Being a native to Asia, the tree has cultural significance to Asian peoples and has been used for centuries for scent, camphor oil, crystallised camphor blocks for use in religious ceremonies and for medicinal propartions. It is also considered a valuable timber for furniture and carvings, in particular icons.Camphor laurel growing in this area has extraordinary colour and grain and as a result there have been times in our recent history where we have exported timber to Asia and later re-imported it as a finished product. The use of this timber locally is limited but many people are starting to realise its value for furniture. There are many fine craftsmen in the region who make some of the highest quality furniture available from this unwanted tree. The Australian Camphor Laurel Timber Association has been formed to promote the commercial and artistic uses of camphor laurel timber as well as other objectives relating to research, fostering awareness of Australian grown camphor laurel and providing support to millers. (PO Box 1320, Lismore 2480). If you have dead camphor laurel logs on the ground they can be used in eroded areas to rehabilitate the erosion by lying them on the ground across the slope and planting in the built up soil. They will also provide habitat for lizards, frogs and other ground creatures. Camphor laurel has been declared noxious in Council areas of Copmanhurst, Maclean, Pristine Waters, Richmond Valley, Kyogle, Lismore and portions of Ballina Council. Several other councils are in the process of seeking declaration. These regulations allow for gradual removal of trees depending on size. Camphor laurel is not declared in Byron Shire although it is prolific in many areas and spreading. It has been found that the camphor laurel forests have become important habitat with food resources for fauna including rainforest pigeons, some of which are threatened species. 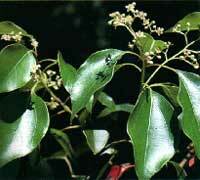 Also threatened flora species are often found in camphor laurel forests. Therefore, a program of gradual removal and replacement with alternative habitat, to include native laurels and other fruiting rainforest trees, preferably those which fruit in Winter & Spring should be considered. As these are slow to mature, a time frame is favoured for removal and replacement. There is other legislation affecting the control of camphor laurel however in Byron shire permission under the Tree Preservation order is not required to control camphor laurel trees unless they are greater than 1M in diameter, measured at breast height and located in urban and village zones. Development consent is required to remove and/or prune camphor laurel trees which are heritage listed. Approval licences may be required from DL&WC, NP&WS, DUAP, EPA and local Fire Authority.